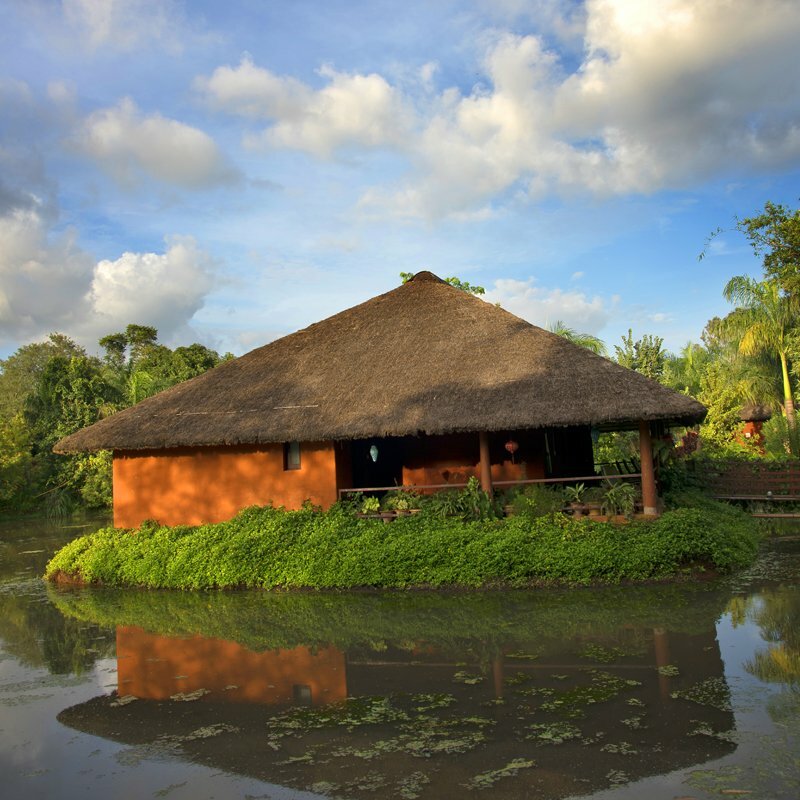 The Phalguni River Resort is declared as an ECO Wellness Resort. 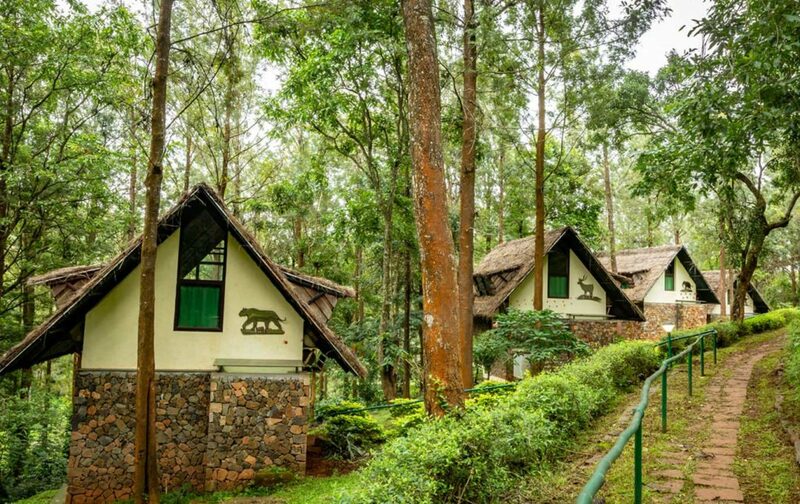 Forest Resorts: This blog post is all about the staying options in various wildlife sanctuaries and other natural forests near Bangalore. You can choose from a wide range of accommodations such as all-inclusive resorts in wildlife sanctuaries, independent cottages, tree houses, and furnished jungle lodges. I will also outline the activities in the wildlife parks, what can you eat and the distance of every forest lodges from Bangalore. Bangalore is a blessed city. The mighty Western Ghat Mountain range is not far from the city. Karnataka State has more wildlife sanctuaries than most of the other states of India. Let us get to know the jungle lodges, riverside camps, resorts, and cottages located in all the wildlife sanctuaries near Bangalore. I am straight away hitting the coastal city of Mangalore that is located some 350 odd kilometers from Bangalore, to its west. Mangalore, the Tulu speaking city is located on the Arabian Sea shore. That is a very picturesque depiction of the Phalguni Riverside and its backdrop. 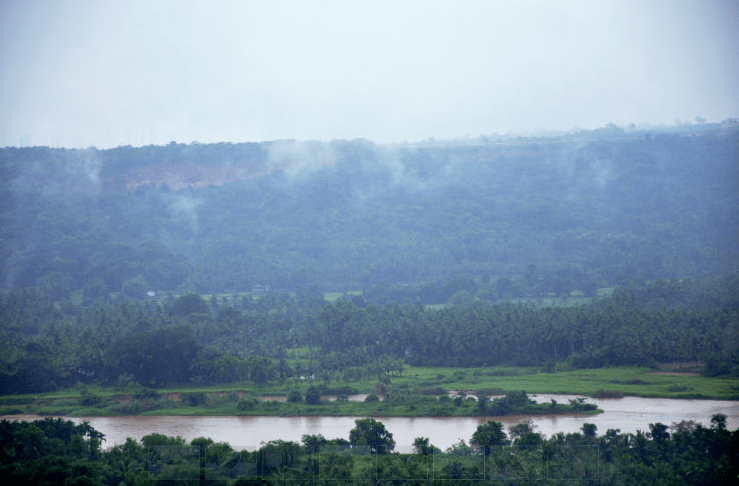 The river you see on the image is Gurupura River but the resort is named after Phalguni River. Mangalore is the gateway to numerous wildlife resorts and hill stations in Karnataka and the neighboring Kerala State. The surrounding area of the resort is a botanical garden with nearly 50,000 trees and that include several species of bamboo trees, hundreds of endangered species of plants and herbs. Other trees that are near the Phalguni River Resort are coconut and acacia. When you have free time while staying in the resort, you can visit several nearby attractions that include St. Mary’s Island, Udipi town, Bekkal Fort, Pilikula Medicinal Garden, Pilikula Nisargadhama cultural center, and Kudremukh hill station. 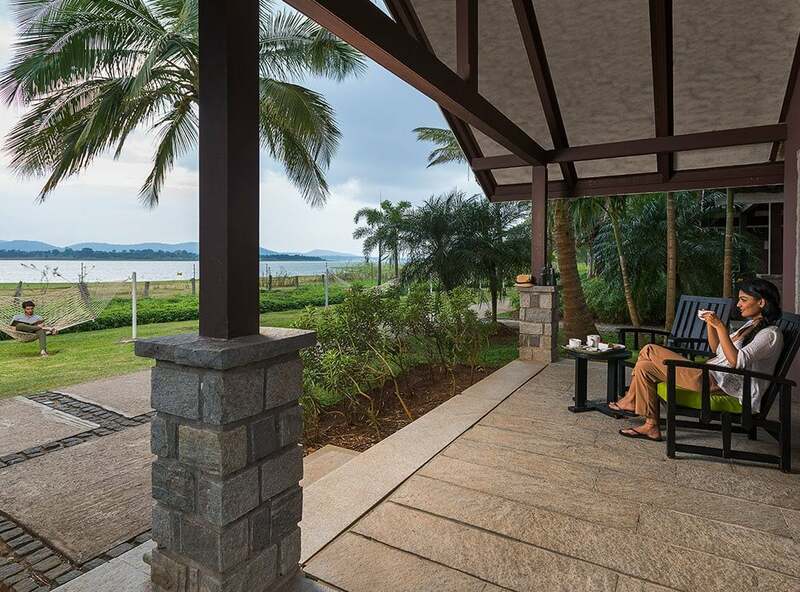 Were you expecting the Kabini Lodge to be listed on top of the list of jungle stays near Bangalore? I too had that intention but the beauty of Phlaguni River Resort begged me to put it on top. Kabini River Lodge needs no introduction to most of the wildlife enthusiasts, especially living in South India. It has been in existence for several years. Its scenic location beside the Kabini River attracts tourists throughout the year. The Kabini River Lodge is located inside the famous Nagarhole National Park. The distance is 225 km from Bangalore. The Kabini River Lodge is surrounded by a vast expanse of lawns and thick bushes that are great habitats for the birds. Call 9449599754 or 08228-264402/03/05 for your bookings. Dubare Elephant Camp (seasonal only). The amenities include an ayurvedic spa apart from well-equipped restaurant that serves Indian and continental cuisine and stocked bar. You can choose your accommodation from royal cottages, ordinary rooms and simple tents. I would prefer the tents that alone can make you feel like you are amidst nature and wild animals. While in Nagarhole National Park, if Kabini riverside is your choice of staying, then, there is another jungle lodge called “Red Earth”, one of the best luxury jungle resorts near Bangalore. The whole area is still and silent, making you reciprocate the same qualities. After all, you have entered the animal kingdom. Since the Kabini River Lodge garners all the attention, the 20 odd cottages in Red Erath resort in Kabini are generally available even at short notices. The bar in Red Earth, Kabini is the talking point. See it for yourself why it is the center of attraction. Yes, it is a bar aptly named, ‘wetland’ because of its location in the midst of a grassy place inside a small pond. Call 87227 45555 to inquire about rates and availability of cottages. I find myself unable to extricate myself from the beauty clutches of Kabini area in Nagarhole National Park. After Kabini River Lodge and Red Earth resort in Kabini, I am happy to bring to light one more jungle accommodation, “The Serai”. Beautifully located on the banks of River Kabini, the forest beyond the river takes off into infinity. You can choose to stay in either Waterfront Verandah or Waterfront Villa. Isn’t that a perfect image of a jungle lodge? It is serenity painted all over. The distance is the same-about 225 km approximately from Bangalore. 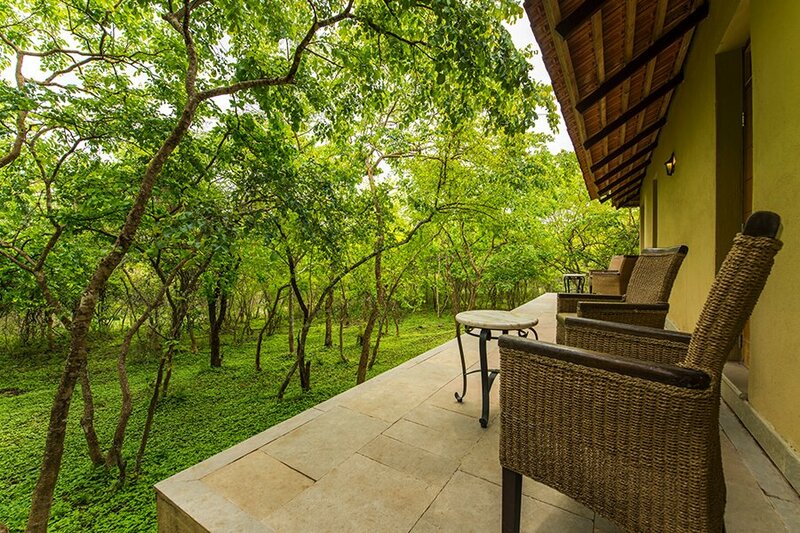 Ah, it is a peaceful setting overlooking the Bandipur forest inside the Bandhipur Bird Sanctuary. The Wind Flower Resort and Spa is gaining popularity because of its scenic location and peaceful environs. Have your own style of accommodation by choosing the luxury suite, independent villa or a cozy studio. From Bangalore, the distance is about 210 km whereas if you are going from Mysore, it will be just 35 km of travel. Like other jungle lodges and forest resorts, the Wind Flower resort too offers an Ayurvedic Spa where the ‘hot stone therapy’ is highly recommended. Of course, the full body massage is the most selected treatment in the spa. Probably, the Wind Flower resort is the only wildlife sanctuary resort where there is a sleeping facility for drivers and personal servants. For the guests of Wind Flower resort, there are several outdoor games are offered that include badminton and baseball. Have you noticed that the eco-wellness retreats and spa resorts are gaining momentum of late? The modern trendy and swanky resorts with all the luxuries of 5-star hotels are slowly replaced by retreats where your stay is a combination of activity and rejuvenation through numerous natural wellness treatments using only naturally available herbs. 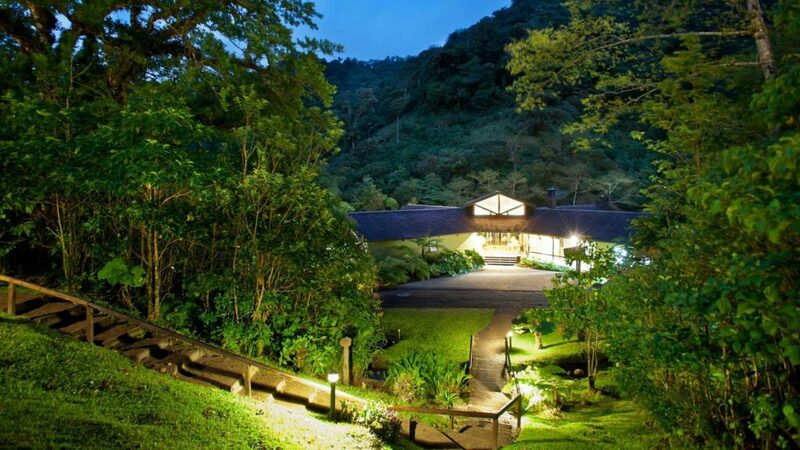 Gorukana Eco Wellness Retreat is located in the B.R. Hills, at an elevation of 3800 feet! The “BR hills” means Biligirirangana Hills when expanded. You can call them at 94808 26377 for your cottage reservation. The wellness resort is part of the BRT Wildlife Sanctuary that is situated close to the neighboring state Tamilnadu. For a change, you can forget about staying on the ground and choose to stay up above the ground in a tree house. Of course, you can also opt to stay in a cottage and feel safe. Staying inside a tent is another option provided by the Gorukana Wellness Retreat. The distance from Bangalore is just 170 km. The Masinagudi Wildlife Sanctuary has occupied a permanent position as the best upcoming wildlife resort in South India, near Bangalore. It is located in the lush green Western Ghats near the border of Karnataka in Tamilnadu State. It is located on the way to Mysore city from Ooty in the Nilgiris Hill Range. Distance from Bangalore to Masinagudi wildlife sanctuary is 245 km. Another 3 km from the main road takes you to the jungle cottages and tree houses inside the wildlife area surrounded by popular Mudumalai and Bandipur National Parks. The rooms are spacious and attached with bathroom and free toiletries. Your tariff includes two meals and breakfast. If you are a vegetarian and don’t eat onion and garlic, then, there is a surprise for you in the Inn The Wild Resort, Masinagudi. You can opt to eat Jain cuisine. For bookings, call 080 3075 2575. Call 89409 91829 and ask for direction for this wildlife resort located in Masinagudi, Tamilnadu. It is about 245 km from Bangalore city via Mysore. The famous Mudumalai wildlife sanctuary is very close to Masinagudi. In fact, Masinagudi is the right place to stay for wildlife enthusiasts to Mudumalai. The jungle resort is built deep inside the forest comprising nearly 100 acres of land in which coffee is actively cultivated. Your stay at the Wilds at the Northern Hay is guaranteed for bliss and peace. You can enjoy a relaxed wildlife safari in an open jeep and on your way, you can see the coffee plantations. Be vigilant to spot gaur, deer, civet, barking deer, striped hyena, and the Magpie robin-the singer. Elephant ride is offered but not during the yearly elephant rejuvenation camp. Apart from spacious suites, you can opt to stay in a tree house also. There is an Orange County in Coorg also but that is not set amidst a wildlife sanctuary. After telling you about a few jungle lodges in other parts of Karnataka and one in Tamilnadu state, I have come back to Kabini area as I just found out a few more forest resorts on the banks of Kabini River, which itself is a mix of two rivers of Kerala. Kabini finally meets the Kaveri River and loses its name forever. Have you ever thought why there are so many resorts, tree houses, cottages and rustic lodges in Kabini? Nagarhole wildlife sanctuary is the main reason for the congregation of accommodations in Kabini that is located just on the peripherals of the Nagarhole wildlife park. The Orange County Resort in Kabini carries another name, “Evolve Back”. An odd name for a wildlife resort-eh? The Orange County Resort offers three types of accommodations that they call “Jacuzzi Hut”, “Pool Hut”, and “Pool Reserve”. I think, since all of them have a thatched roof, they are called ‘huts’. However, the huts come with excellent facilities and comforts that include television, air-conditioner, mini-fridge, coffee/tea making machine, and plunge pools. Your rate includes three-time food; yes, Orange County in Kabini can be called an all-inclusive resort. Amenities include waterfront verandah, a gym, and an ayurvedic spa. This is another safari lodge in Kabini area that is somewhat less priced when compared to other safari resorts in Kabini. Call 99006 13595 to find full details. Maybe the price will fit your wallet size. I am sure the video below will hook you to Bison Resort in Kabini. Did you like the Bison Resort? If so, call 080 4127 8708 and inquire more details of the resort or just read further. The Bison wildlife resort is another one that is located in Kabini and close to Nagarhole National Park. The secluded location speaks for the confidence of the resort developers who must have thought of providing every modern comforts and luxury so that you don’t feel deprived of anything because of the secluded location. 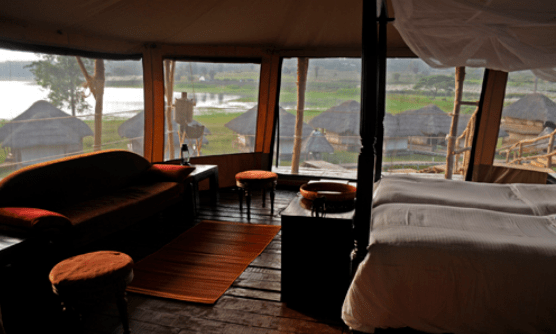 The accommodations are stylishly designed tents with luxuries and facilities that include wooden flooring, bathroom, sofa, and a verandah facing the Kabini River. Look below an image of an accommodation called, “Machaan’. The proximity of the waterfront means, freshly caught river fish and crabs, boat cruising, and walking along the riverbanks. Call 080 4127 8708 for booking in one of the finest jungle lodges near Bangalore. Bandipur National Park is a well-known tiger reserve in Karnataka. The sanctuary comprises 870+ sq.km. The entire tiger reserve can be seen by traveling in an open jeep arranged by the jungle lodge. I must admit the tiger sighting depends purely on luck but the elephants can be sighted in herds several times a day at various places inside the forest. This eco-friendly jungle resort also arranges bird watching trip if there are more than four avid birders. Being an eco-lodge, there is no air-conditioning at all in any of the jungle cottages. You need not go out of Bangalore City as this nature camp is located very much within the Bangalore city and inside the famous Bannerghatta National Park. The zoological park in Bannerghatta attracts thousands of visitors every day because of the range of wild animals and birds that are housed inside the zoo. The jungle accommodations are offered well within the deep forest and hence, you will feel absolutely one with nature. You have a choice of staying in any one of the cottages. If you have had enough of getting lodged up in a cottage, you can try to stay in a large chalet or simply sleep in a tent. I would rate the last option is the best. Do you like what you read thus far? Feel like spending a night in Bannerghatta Nature Camp? Then, call 94495 99756 to reserve your accommodation. The hill station Chikmagalur is located 250 km away from Banglore. A predominantly coffee producing area in Karnataka, the entire region is mountainous with very beautiful places and green slopes. Bhadra reservoir stores the water of Tungabhadra River. When the dam started attracting tourists, a few jungle cottages have come up and one of them is the Tern River Lodge. The nearby attraction includes a mini tiger reserve called Bhadra Tiger Reserve. Your staying options in Tern River Lodge are individual cottages and log huts. 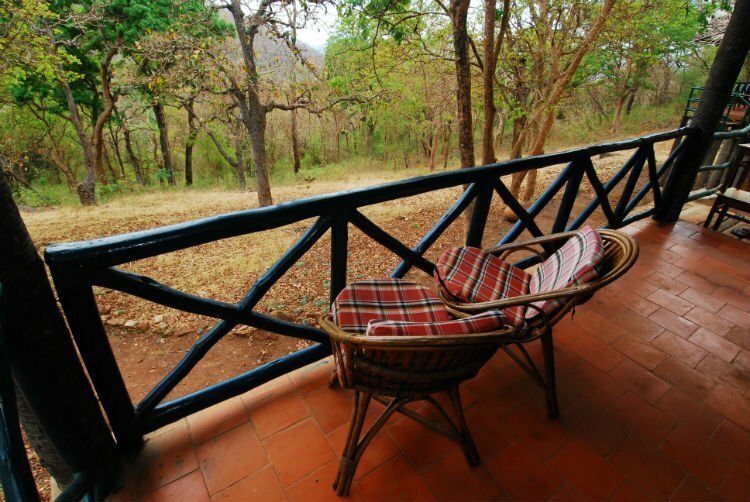 If you want to visit the Bhadra Wildlife Sanctuary by staying overnight at Tern River Lodge, call 082612 15425. Little less than 180 km from Bangalore and just on the outskirts of Mysore is the scenic Kyathadevara Gudi Wilderness Camp that is also called conveniently as K.Gudi forest lodge. From your jungle hut, you can go on an animal safari in an open jeep. While elephants and bison roam freely in herds, the athletic leopard is always elusive. Contact phone number: 93796 76618 Call to book your accommodation that includes log huts, tents and suites. The Mudumalai wildlife sanctuary is one of the most visited forest areas in India. It is located close to Ooty, Tamilnadu State. You can see the bold road sign on your way from Ooty to Bangalore via Mysore. Mysore is at a distance of 87 km and Bangalore is located at 235 km away. Glen View Resort is right on the lush green Western Ghat Mountain range. Glen View Resort has a presence in many places near Mudumalai that include Masinagudi and Bokkapuram. The jungle resort is reached slightly inside the wildlife sanctuary. 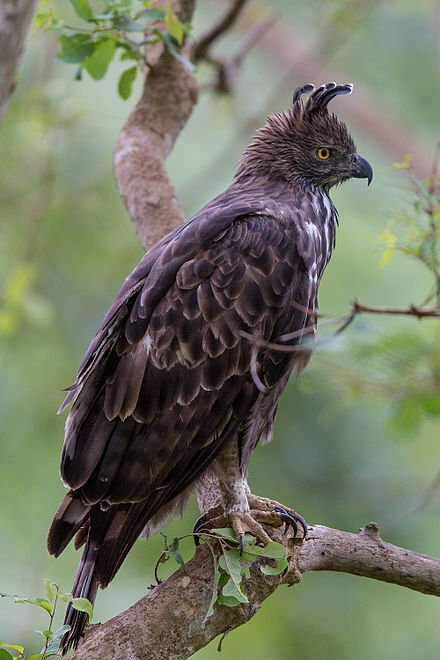 More than the wild animals such as the tigers and elephants, Mudumalai is a very good spot for colorful birds that live in the shoals of Nilgiris Biosphere. Glen View resort in the Mudumalai wildlife sanctuary offers several kinds of accommodations such as cottages, log huts, and tents. These are the names of different tribes living in the Nilgiris jungles. If you are dying to stay in a tent, book the Rajasthani Tent or the Camping Tent and experience the most memorable night in your lifetime. Imagine a day without internet and television but a day with the sounds of the jungle. In addition to these huts on earth, there is one built high up on a bamboo tree. It is called Signature Hut. Yes, it is a tree house. After lunch, go on a wildlife safari in an open jeep or on the back of a trained elephant. Join a group of trekkers and go on a short expedition in the Western Ghats and spot brilliantly colored birds that would reveal their location through mellifluous songs. Glen View Resort also organizes mountain biking sessions and campfire during the night. Masinagudi and the adjacent Mudumalai area are dotted with numerous resorts, jungle lodges and forest cottages. The Mudumalai wildlife sanctuary and the Bandipur National Park can be easily reached from Bangalore via Mysore in about 6 hours or so. One of the forest resorts that are located in a beautiful and picturesque location is the Bamboo Banks Farm and Guesthouse. The name is indicative of the type of accommodation you can expect. A surprising element of the location of the game resort is the Avalahalli River that flows nearby. This means the chances of sighting forest animals and mountain birds are high. There are only four luxurious cottages in the jungle resort without the essential evil ‘the Internet’. The cottages are spaced apart from each other and also from the main building that houses the dining area and recreation room. Since the guests are very limited, you can expect personal attention. In addition, food preparation can be customized. The food is said to be delicious made with organic produce from the hills. Apart from going on an animal safari, you can go to the Theppakadu Elephant Breeding and Rearing Camp. The Bamboo Banks Farm is the most sought after jungle resort near Bangalore because of its excellent location inside the Mudumalai Wildlife Sanctuary and gourmet food. In addition, wildlife sightings are better if you opt to stay in this game reserve. I have pinned this post for future reference. I stay in Bangalore, and this will help me plan my weekend getaway.